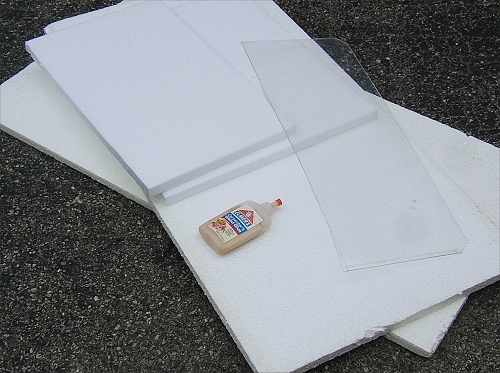 One common way of setting up temporary displays that can moved or stored and reused is to use foam insulation boards. You can cut this material easily with a hot-wire Styrofoam cutter such as the FloraCraft Wonder Cutter, although you can get by with a sharp knife if you're careful. For irregular edges, busting up the foam is about as effective, although it can create a snowstorm of sorts, especially if you're using the kind of foam that has the little bubbles. You don't even have to use white foam board. Most people who do this use a coat of latex "indoor" house paint or the like to keep the dust down anyway. 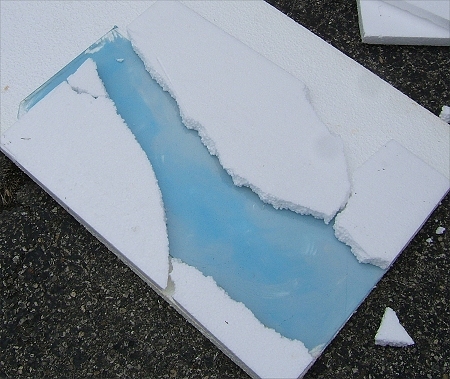 So you're just as well off starting with blue foam boards. 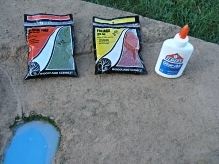 You'll also need appropriate glue (see below), and eventually paint and other materials. But this article will help you get a "base" for your portable display. How Big Should I Make My Display? Use a 2" or 3" board as a base. Cut it to the width and length you need. If you are just setting out buildings and accessories, and you are not planning on including a train in this display, the display can be whatever size you want. If you are using a train, the minimum direction in either length or width will be between 42" and 60", depending on what kind of train you are going to run--put the track oval down temporarily to be sure. Measure across the outside edge. If you have the space, add a few inches at each edge for "safety.". If you don't feel you'll have room to store big panels, think modular. Two 30"x52x panels can go together to make one 60" x52" display. When choosing a dimension, you should also think about where you will be setting your base. For example, you could get two of those 60"x30" plastic-topped portable tables that people like using for garage sales and the like. 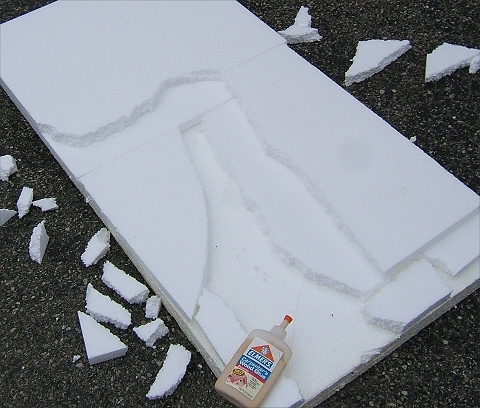 Then if you used two 60"x30" styrofoam panels for a base, you could turn them 90 degrees so that each piece sits on both tables for increased stability (especially if you use clamps or some other method to fasten the tables together). 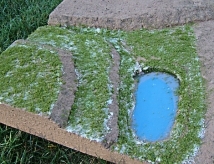 Once you have decided which pieces you're using for your base, lay the track out on it in the pattern you expect to use eventually. Bust up or carve up the other pieces to create layers that will give your town a little elevation. You'll probably want most of the village on the same level, a little above the level of the train, if you're using a train on this display. This is easy to do if you plan ahead. 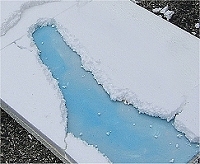 In the photo to the right, we're planning on including an "ice-covered" river made of lucite. You can barely tell, but the lucite panel is in place, so I would know where to place the other parts. After I took this photo, I painted what would become the "bottom" side of the lucite and allowed it to dry. 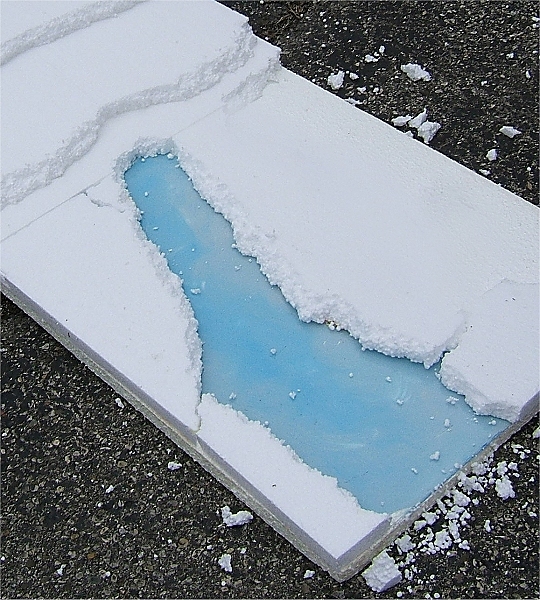 For information on using lucite or Plexiglas(r) to simulate lakes and rivers on an inside railroad, please refer to the article Easy Indoor Lakes and Rivers. While the paint was drying on my "river," I did some additional contouring on the rest of the display. I didn't glue it all together until the river was ready to be installed, though. 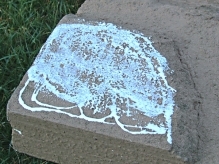 In the meantime, I learned some of hazards of working with foam outside, even on a fairly windless day. 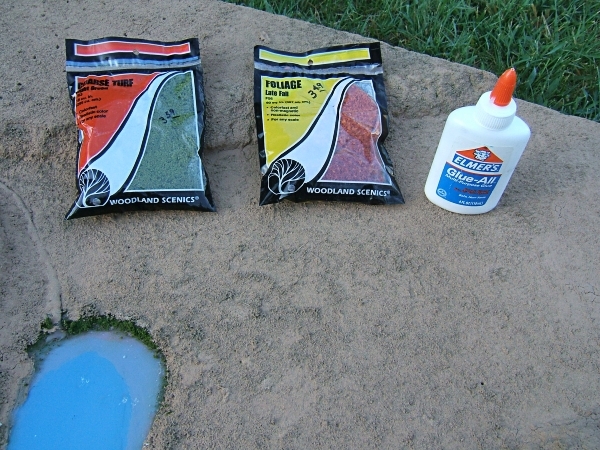 Using Liquid Nails or a similar glue that works on urethane foam, glue your "hills" in place. A low-temp glue gun will work, although you will use a lot of glue sticks. 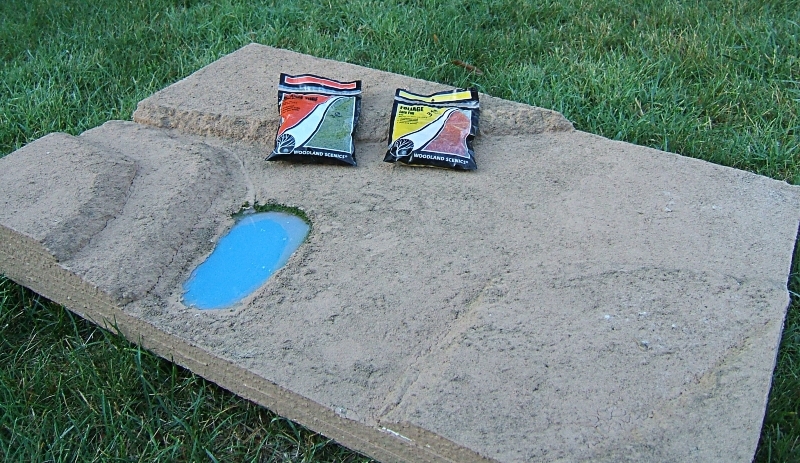 If you're likely to wind up storing this someplace damp, consider a moisture-resistant glue. On this project, the carpenter's glue took a very long time to dry, so that I wound up weighing the pieces down to keep them from blowing away. On the other hand, all the little white balls from the foam did blow away, so that's a good thing about working outside. 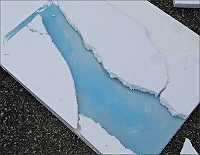 Once the glue has thoroughly dried, smooth down the edges so the layers of the foam aren't quite so obvious. 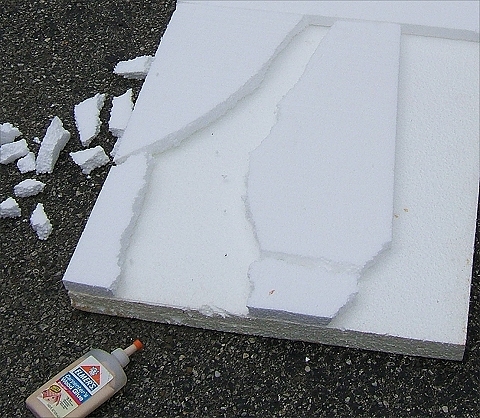 If you're using the kind of foam without little bubbles, you may need a sharp knife. If you're using the kind with bubbles, you can usually wear the edges down without too much trouble. Get out the latex, acrylic, or other water-based paint. (Oil based paints and spray paints may cause the foam to dissolve, either immediately, which is fun to watch, or over time, which is less fun.) If you're going for snow, white is all you need. Some folks using white foam don't think it's necessary to paint white over white, but a coating of paint helps stabilize the foam, reduce dust absorption, and reduce the amount of "snow" you leave every place the thing is set or stored. This is the last photo of the "snow" project, as I passed it on before I was quite finished with it. 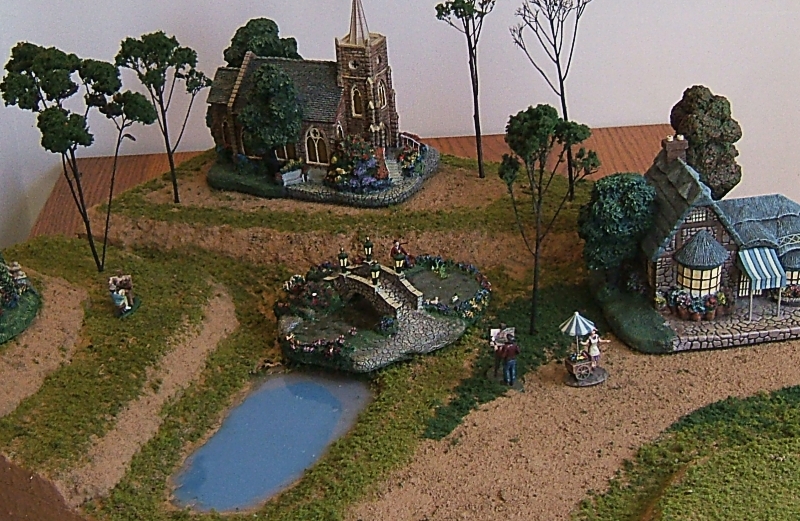 The next photo starts with a smaller unit we made for indoor display of houses only. Hope this isn't too confusing. For this unit, we wanted more of a summer look, so we painted it something besides white. In this case, I used a textured paint we had left over from painting our bedroom, so that added a nice texture, too. You'll notice I painted the edges, too, which helps stabilize the foam where it's likely to get bumped. It also gives the whole thing a more finished look. Choose a fairly neutral brown, if you have a choice, something that is the color of dry dirt, which, in most parts of the country is a light greyish-brown. You could paint the grass on. 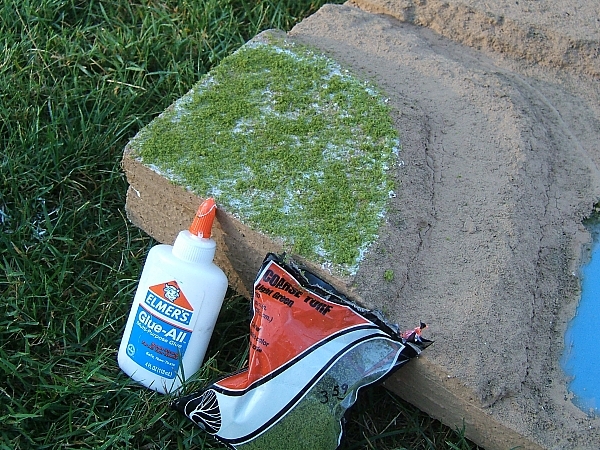 But if you want a nice, textured look, visit your neighborhood hobby shop and get some "grass," "dirt," "gravel," or other materials. 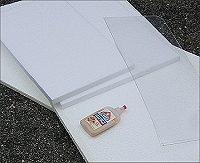 I use Elmer's or any similar "white glue" to glue it down. It cleans up with water and dries clear, and it's not like you are planning on leaving this in the rain. Clip the bag you're going to use open on one end (you'll be down to "one hand" in a moment). 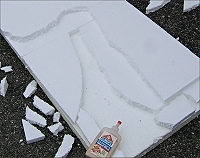 Spread the glue out over a small patch of surface; then smear it out. You now have about five minutes to work before the glue starts to set up and about twenty minutes before it's too dry to do anything with. 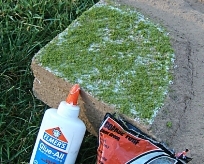 Sprinkle the "grass" or whatever onto the glued space. Then tamp it down into the glue. Don't worry if you're still seeing white, or even a little brown. 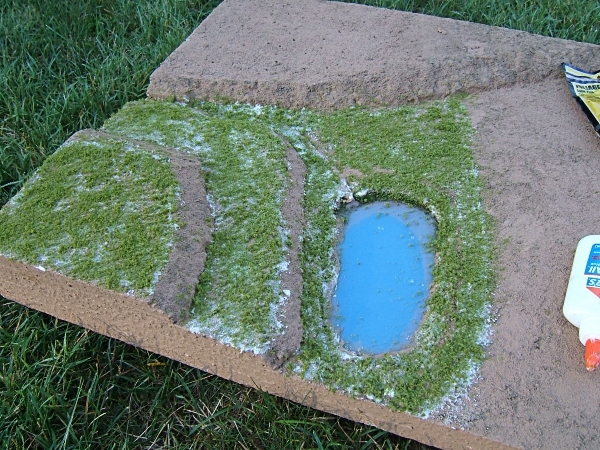 The white will go away when the glue completely dries, and the brown showing through the "grass" here and there actually looks more realistic than a totally green patch. For a more permanent display railroad/village setup, you could put the whole thing on plywood reinforced with some carefully-joined 2x2"s. Whether you build legs onto the "tabletop" or set the tabletop over something else (such as your dining room table), you still need to be certain that the thing won't slide around or wobble too much once you put your collectibles on it. Once you're satisfied that you have the right "foundation" for your railroad or village display, the rest consists mostly of trying things out to see where they look right. The photo at the right shows the same foam platform with a few buildings and trees in place to give you an idea of how it will look when it comes together. I tried some Thomas Kinkade buildings with it because the had a more "summery" appearance, and most of my other collectible or ceramic buildings had snow on the roof. 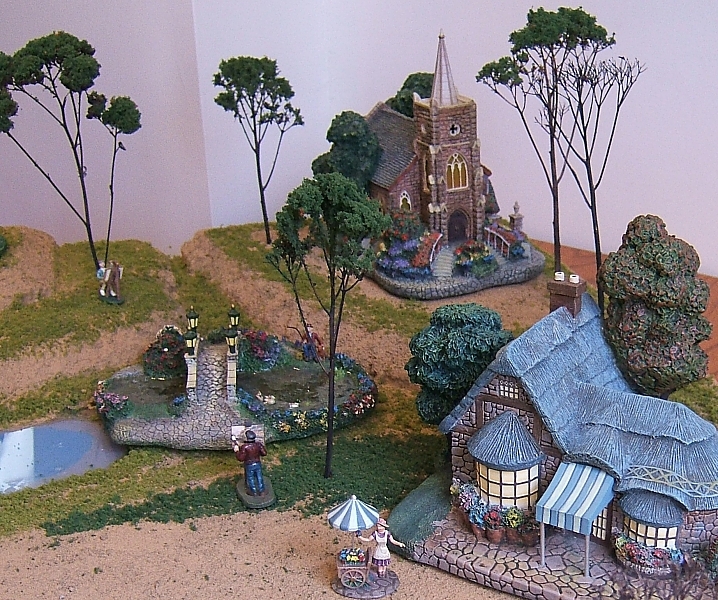 The trees on the display (besides the sculpted ones attached to the structures) are made according to the instructions in our article "Easy Homemade Trees." Of course you have to make your display fit your needs, and the season you're modeling. I hope to have photos of other, more finished displays as time goes on. Note: Whatever you do, never move the base of your display railroad with any of your buildings or accessories on it, not even a foot! You don't want to take any unnecessary chances. 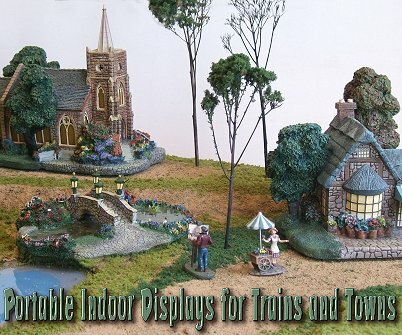 Note: Many more suggestions are available for giving your indoor display railroad realism and appeal; we will add some ourselves as we have time. We will also add photos as they become available. If you have suggestions, photos, or other contributions, contact us - we will make certain you receive full credit. In the meantime, this is just to get you thinking about things you could do with relatively low skill and expense.